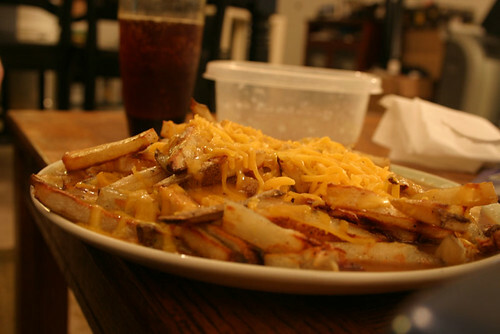 Friday night I make a baked version of poutine, from this recipe. The good part about this as compared to real poutine is the fries are baked, meaning somewhat lower fat. It uses whatever good melty cheese you like (the recipe calls for gruyere, but I used cheddar). Tips: Make sure you spray down the baking sheet with some non-stick stuff if you're not using non-stick baking sheets. otherwise you'll have an embarrassing moment when you try to flip over the fries. Don't oversalt. The gravy will be plenty salty. Use a plate with steep sides so the gravy doesn't get everywhere. Be prepared to nap for a long time. Delicious. You are now a damn Canadian. Enjoy your health care, you’ll need it after your heart attack.